As part of our occasional series of articles interviewing professionals working in the New Zealand art industry (see for example an industry snapshot of digital fine art printing and last year's interview with Auckland studio photographer Bret Lucas on how to photograph paintings ) this week NZ Art Print News talks to paper conservator Lynn Campbell. 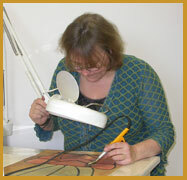 A paper conservator's job is concerned with the preservation, cleaning and repair of art works on paper like prints. Lynn was incredibly generous with her time and sent through some superb background information about her work in art conservation and what is actually involved in training to be an art restorer like her. So in this first article we'll meet Lynn, let you know a bit about her background and describe how you train to be a paper conservator plus try and give our readers an idea of what it's like to work in art restoration. In our next piece Lynn will then tell us what is best practice for the long term storage and display of artworks on paper such as prints. When we wanted to find the best advice on how to care for fine art prints there is no better source of expertise than New Zealand's own globetrotting paper conservator Lynn Campbell. Lynn's company here in Christchurch, Campbell Conservation, offers a full range of paper conservation, alongside fine art works on paper like old prints she also works on repairing and preserving documents, archives and even wallpaper. Lynn teaches preventative conservation processes including disaster preparedness for collections, good handling, risk mitigation including storage and does conservation surveys of collections along with general care of art works advice for collectors. Campbell has just returned from her time as a Getty Guest Scholar at the Getty Conservation Institute (motto "Preserving the world's cultural heritage to advance civil society") where she shared her professional response to the Christchurch earthquakes in the paper An Investigation into New and Recent Methods and Processes Involved in the Salvage of Heritage Collections in an Earthquake Zone. The Getty Institute has a global focus working to advance "conservation practice in the visual arts, …serving the conservation community through scientific research, education and training, model field projects, and the broad dissemination of the results of both its own work and the work of others in the field." Another career highlight was three trips to Antarctica, as Lynn told us "I was one of the first conservators to travel to Antarctica to work on the three historic huts there. 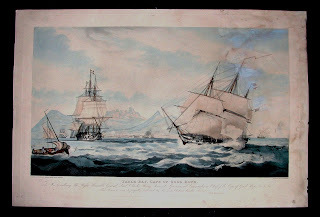 I returned twice after this to continue work on the huts of Scott and Shackleton". Why did you become a paper conservator? We asked Lynn to tell us a bit about her background and how she became an art conservator who specialises in paper. She told us that she originally came from the UK and initially obtained a BA (Hons) in fine art printmaking. Lynn says "I was always interested in conservation but it was only after I had finished my degree that I realised there were courses available to train in paper conservation in particular". Although she had been fascinated by museums as a child it was not until her teaching degree year that she "realised that there were courses in conservation. So I immediately applied to the Newcastle course [the "Post Graduate Certificate in Fine Art Conservation" from Newcastle University] and was accepted the next year". Post graduate degrees in both teaching and the conservation of fine art led to her first position at the Royal Scottish Museum in Edinburgh. Campbell then returned to teach on the Masters degree course in Conservation at Newcastle upon Tynne and just before she immigrated to New Zealand she taught basic conservation skills to archivists from throughout Africa in Zanzibar. In NZ she worked at what was the then Robert McDougall Art Gallery (now Christchurch Art Gallery) before launching her independant art conservation practice, Campbell Conservation. What training do you need to work in Fine Art Conservation? We asked Lynn what is taught at a post graduate course in fine art conservation. She told us "when studying in the conservation of Fine Art on paper one has to learn a great deal about practical methods and processes including the study of chemistry and physics". She quoted the fine art conservation course at Northumbria University which states "The ultimate goal of a paper conservator is to stabilise objects to ensure their continual existence. This not only entails state of the art treatment techniques on individual items but extends to the preservation needs of an entire collection." "The scope of the paper conservators’ work has widened in recent years and they are often involved with issues relating to collections care such as developing and maintaining archival housing standards, exhibitions, advocacy and project management." Paper objects are particularly vulnerable to light, humidity and air pollutants as well as contact with harmful materials such as acidic backboards, pressure sensitive tapes and ill-fitting frames. Deterioration can also occur through improper handling and exposure to active mould spores. " Next article we look forward to talking with Lynn about how to best preserve your works on paper (such as antique or artists' prints) for long term storage and display. UPDATE 12/4/12: As promised the second part of this article, "How to look after fine art prints", has now been published.